I can’t deny it any longer. Football season is here. And this year, it’s two against one as BL has taken to dressing Vander up in matching dad & son Green Bay Packers tshirts. I can’t make this stuff up. Even though I currently refuse to enroll Vander in football, I know the moment will soon come where he gets just as excited about football games as BL. Did I mention that he was put on the season ticket list right from birth? Currently in the 130,000 wait list range; which is safe to say that he’s probably never getting them. Unless he lives to 157. Therefore, I’m back to game-day snack maker. This time though, I wanted something that both my boys could enjoy. 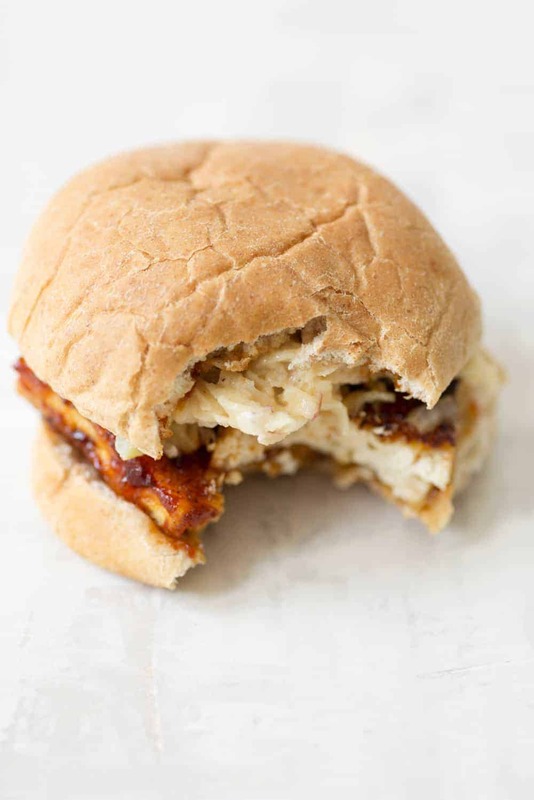 While slaw and slider buns are still a little too complicated for Van, he can eat his body weight in tofu; especially tofu that’s slathered with BBQ sauce. These sliders came to me after I made every apple dessert possible last week. We went apple picking and per usual, my eyes were way bigger than my head. We left with almost 30 pounds of apples, of which 10 would have been plenty. I made pie. I made crisp (coming later this week). I made applesauce and then, I made this slaw. 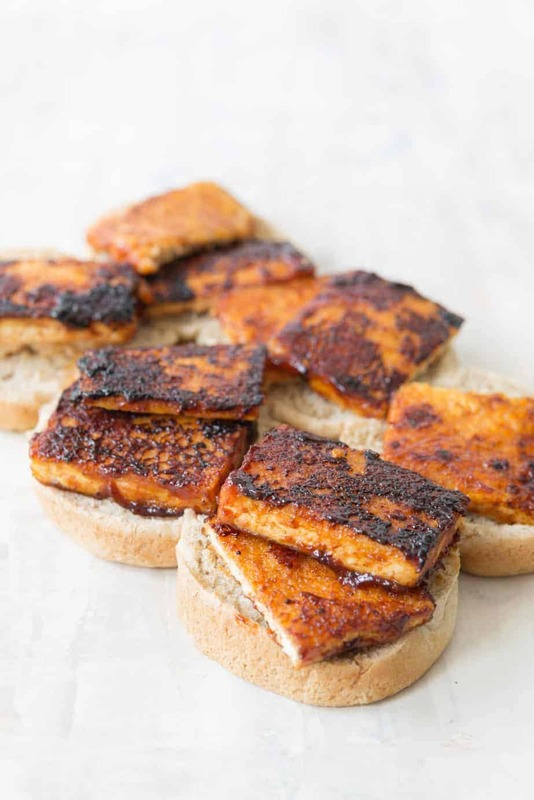 Creamy, crispy and perfectly tart, it pairs so well with crispy BBQ tofu! While the tofu does take a little time to bake, it’s pretty hands off. Rub with the spice mixture, then bake until chewy. Add on the BBQ sauce (any brand works, we love Annie’s) and finish cooking. 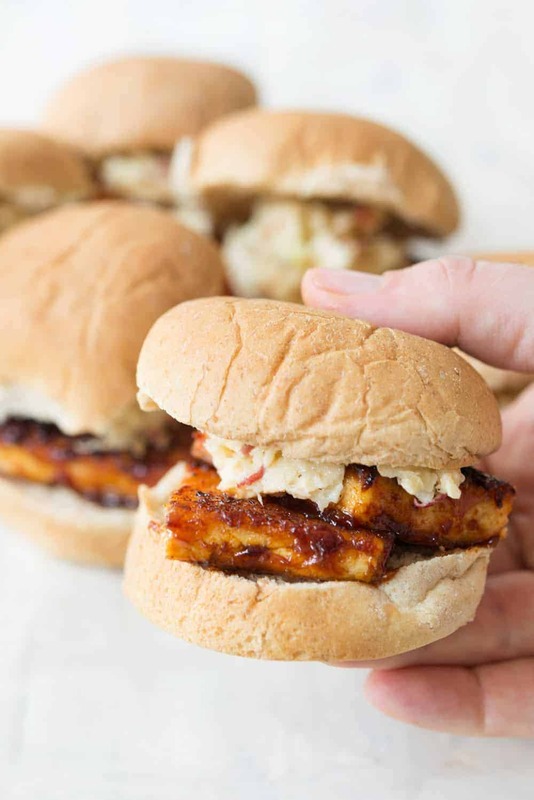 Then top pillowy slider buns with the BBQ tofu and a lot of apple slaw. Is there anything cuter than a slider bun? I LOVE them so much more than regular burger buns. I usually make a spread of 2-3 things on game day (more so for me than BL) and therefore slider buns make the perfect accompaniment. I like that I can have one as I’m putting everything together, then one or two more throughout the afternoon. Yum! 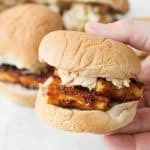 BBQ Tofu Sliders with Apple Slaw. These sliders are perfect for tailgating parties, football games and get togethers. 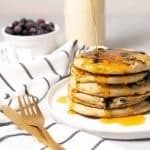 Vegan and delicious! Crispy BBQ tofu with creamy apple slaw. Preheat oven to 425 degrees F. Drain and press the tofu (using either a tofu press or by wrapping the tofu in papertowels/a dish towel and placing something heavy on top.) Let sit for at least 5 minutes to get as much water out as possible. Slice the tofu into slabs- I slice in quarters, then in thirds again to get 12 thick slices. Combine the seasonings and olive oil in a small bowl and rub over the tofu. Place on a lightly greased baking sheet and roast, flipping halfway through until crispy, about 30 minutes. Remove from oven and baste with BBQ until coated on both sides. Place back in the oven for an additional 5 minutes to warm through. Remove from oven. While the tofu is baking, make the slaw. Whisk together the sugar, vinegar, mayo and salt and pepper until sugar is dissolved. Toss with the cabbage, carrot and apple until well dressed, adding more salt/pepper as needed. 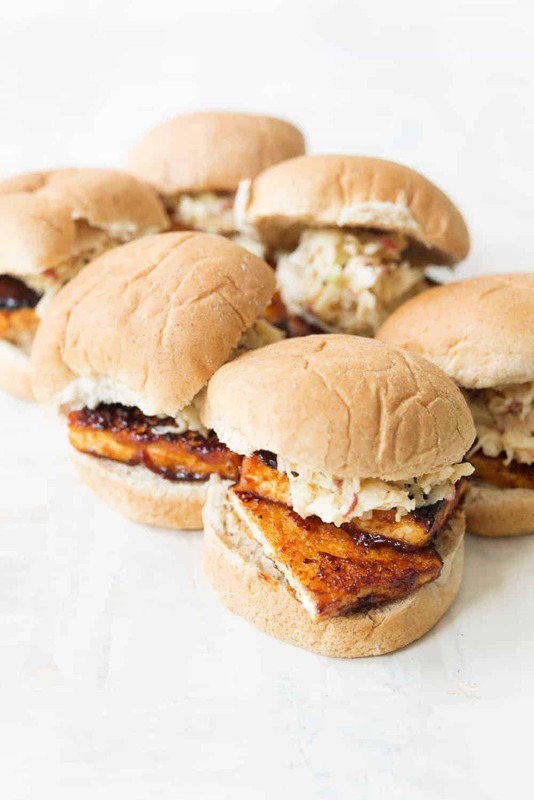 To serve, top the BBQ tofu on the slider buns along with a heaping pile of apple slaw. *I love frozen and then thawed tofu for this dish as it has the best texture. But, if you don’t have time to do that then just use firm tofu drained and pressed. * To easily shred the vegetables, I use a mandoline or my food processor. 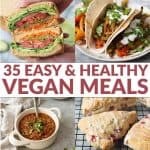 My husband and I are trying to eat more vegetarian meals. We deemed this one a keeper! So glad to hear! Thanks JaNae!